I am very pleased to announce the release of a new report by the Australian Research Council Centre of Excellence for Creative Industries and Innovation (CCi) and Creative Commons Australia – Unlocking the Potential Through Creative Commons: An Industry Engagement and Action Agenda. This report draws upon the CCau Industry Forum, a research-focused industry engagement event hosted by CCi in November 2006. 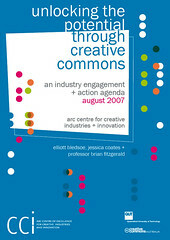 The event was designed to follow up a recommendation in the Australian Government’s 2005 Digital Content Action Agenda report that the industry should “engage with work occurring in the area of alternative approaches to intellectual property licensing, such as Creative Commons”. Focusing on the government, education and the creative industries sectors, the Forum aimed to evaluate understanding of and attitudes towards copyright, open content licensing (OCL) and the Creative Commons initiative within Australia. The Unlocking the Potential Through Creative Commons report evaluates and responds to the outcomes of this Forum and presents a strategy for continued research into Creative Commons in Australia. Full copies of the report can be downloaded here. Creative Commons Luxembourg launch for the 3.0 Licences is announced on the Luxembourg Innovation Portal. Registration is free but desired, so we know how many will be coming. Registration Link. Please note that all presentations will be in FRENCH.